From the middle of 2010 to the end of 2017, the IRS revoked the tax-exempt recognition of more than 760,000 nonprofit organizations for failing to file Form 990 returns. More recently, it has implemented the 1023-EZ process, which makes applying for federal tax-exempt status easier. What effect have these changes had on the numbers of nonprofits in our sector? Are there marked differences in trends vis-à-vis 501(c)(3)s and 501(c)(4)s? This first-of-its-kind analysis is informed by two key data sources. The first is the Internal Revenue Service Data Book, the annual compendium of IRS statistics published since 1863—specifically, the data contained in Tables 24, 24a, and 25 of the Data Books from 2007 through 2017. 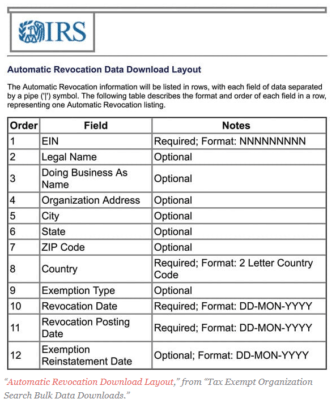 The second data source is the IRS’s automatic revocation data, downloaded from the IRS website.